The final event of the first day of a state visit is always its very best part (at least for the jewel lovers among us): the state banquet featuring gowns and tiaras. Today was no different and while Grand Duchess Maria-Teresa's adorned her head and wrist with parts of the citrine parure, Hereditary Grand Duchess Stéphanie sported the amethyst parure previously seen on her for national day 2013. The Hereditary Grand Duchess wore a plum sweetheart-neckline lace dress by Diane von Furstenberg with a defined waist and soft fishtail hem. The Grand Duchess' dress looks like Elie Saab but I'll get back to you with a confirmation if I find it. (Update: It's indeed Elie Saab, thanks to Order of Splendor.) Needless to say, the gentlemen also looked dashing. Not an awful lot more but a few additional pictures at Wort and Tageblatt. Also have a look at RTL's news report about today. Looking good, Ladies! Looking forward to seeing more pictures. 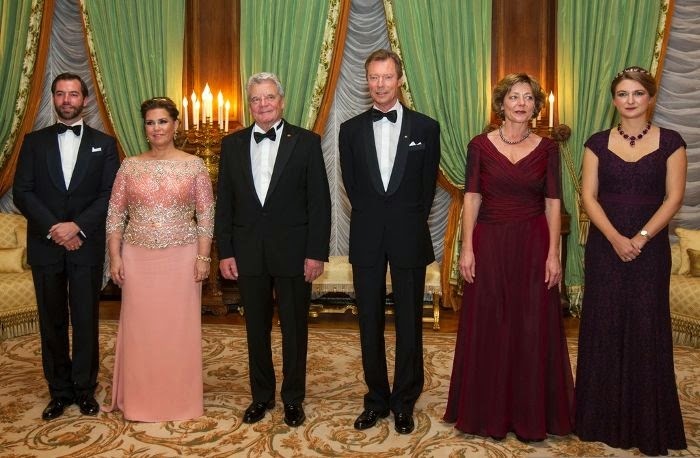 The grand ducal ladies both look smashing. A bit late but I have to agree. A great outing for both of them! Black court pumps for men are considered correct with white tie in Britain and the US.